Jerusalem's #1 all womens' band brings to you an inspirational and dynamic experience; the arrangements are powerful and diverse weaving the styles of jazz, rock, folk, latin and middle eastern music, transcending the listener to a world beyond their own. Tofa'ah (Phenomenon in English) is a group of eleven American Jewish Women musicians living in Jerusalem Israel. Striving for unity and peace, they have by their example shown the importance of Communication, Human Kindness, Spirituality and Positve Expression. 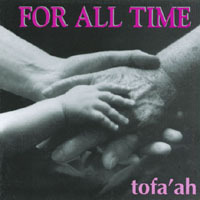 "For All Time" (Their 5th release) celebrates 15 years of inspirational and dynamic music. Here, they have combined a wide variety of musical heritages, creating a unique and uplifting experience. The backdrop is rich with percussion, drums, guitars, bass, keyboards, flutes, saxaphone, bagpipes, English horn, harp and voice. The arrangements are powerful and diverse, weaving the styles of Jazz, Rock, Folk, Latin and Middle Eastern; transcending the listener to a world beyond their own! Tofa'ah has brought people together in joyous song. It is their wish that you too, will join them and sing these songs. This is one of the finest CD's by one of the finest all women's bands around.Great music in English with spiritual themes. A great band, original melodies that are soothing and easy listening.